I've read countless emails and posts inquiring where to find royalty free music and Foley effects. There are numerous companies producing royalty free audio, some fair, some good and some excellent. Then there are applications such as Soundtrack Pro, Garage Band and Sonic Fire, which is a hybrid of sorts, that enables you to create your own music and effects. Soundtrack Pro and Garage Band are quite good but demand a feel for music and rhythm as well as a great deal of time in order to produce the right cut for your project. Having been referred to the Sound Ideas website I found yet another company producing royalty free effects and music. They have a very large and seemingly limitless library of different music forms and effects to choose from so, this time, I focused on the Foley effects rather than the music. Being a diver I chose their 'Underwater' series package to evaluate, but keep in mind that quality in one series is usually indicative of quality throughout a companies productions. 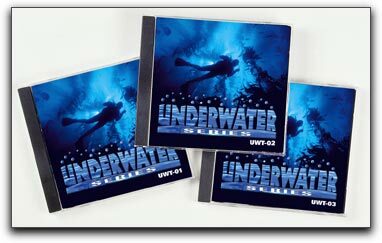 The Sound Ideas 'Underwater Series' falls into their specialty sound effects collections and consists of 3 CDs and 1 DVD bearing with them roughly 500 different sound effects relating to the water. In this vast collection you will find an abundance of Foley FXs of a variety of scuba sounds, diving and swimming, boating, sinking ships and underwater avalanches. There is also plenty of audio of watery ambiance, caves, lava and explosions, waterfalls, sonar, beach and ice sounds and household appliances like bathtubs, toilets, washing machines and various water pours. If you want a clip of someone screaming underwater, that's here too. According to the information on the Sound Ideas website, the majority of these sound effects were recorded from an underwater perspective using a pair of state-of-the-art B & K hydrophones and the collection also includes a DVD version of the CD content, offered in broadcast WAV format that has been embedded with a full set search metadata. All the files have been mastered so that the sound effect descriptions, categories and other library information is stored within the file, making it visible and ready for immediate use in many different software applications in both the PC and Apple platforms. These 16 bit 44.1 K BWF files can also be played on any conventional WAV media player. Foley FX CDs and DVDs are not hard to come by as many companies do produce them. It has been my experience that they are all far from equal. Even many of the sound FX in Soundtrack Pro and Garage Band sound, to me, as if they have little bass support. Some collections sound good, some great and some, downright cheesy. For those familiar with Howard and Michelle Halls' brilliant IMAX production "Isle of the Sharks", Foley effects were used generously throughout the film. I thought each effect used in this film sounded wonderful. As I scrolled through many of the royalty free sound effects in the Underwater Series collection I was pleased that each of the audio effects' sounded rich and full. They reminded me of Howard and Michelle's film. There was a good spread throughout the frequency range with a strong bottom end where and when it was needed. While I can't state that I sat and listened to each and every effect, I heard none of the whiny tinniness that I have often heard in a great many other collections. My bottom line is that, while this is the first collection from Sound Ideas I have heard, I look forward to previewing many of their others. 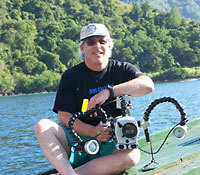 The Underwater Series is not cheap but then quality rarely is.